64 • April 2018 • S I G N & D I G I T A L G R A P H I C S ARCHITECTURAL AND ENVIRONMENTAL • Is your designer capable of sign design for a wall sign mounting detail (section view drawing) as well as a ground sign installation detail, quickly and efficiently? • Is your designer capable of vectorizing a logo, quickly and efficiently? 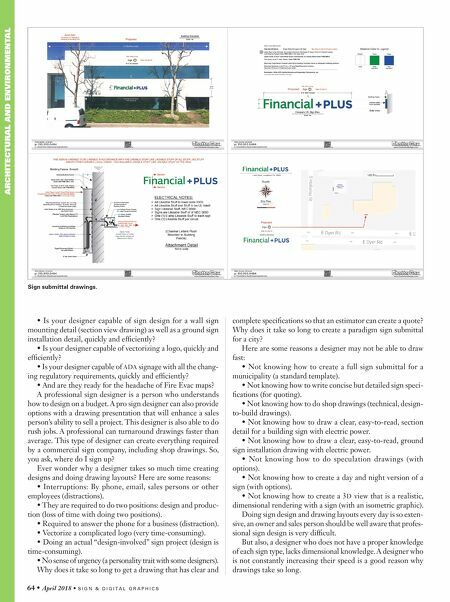 • Is your designer capable of ADA signage with all the chang- ing regulatory requirements, quickly and efficiently? • And are they ready for the headache of Fire Evac maps? A professional sign designer is a person who understands how to design on a budget. A pro sign designer can also provide options with a drawing presentation that will enhance a sales person's ability to sell a project. This designer is also able to do rush jobs. A professional can turnaround drawings faster than average. This type of designer can create everything required by a commercial sign company, including shop drawings. So, you ask, where do I sign up? Ever wonder why a designer takes so much time creating designs and doing drawing layouts? Here are some reasons: • Interruptions: By phone, email, sales persons or other employees (distractions). • They are required to do two positions: design and produc- tion (loss of time with doing two positions). • Required to answer the phone for a business (distraction). • Vectorize a complicated logo (very time-consuming). • Doing an actual "design-involved" sign project (design is time-consuming). • No sense of urgency (a personality trait with some designers). 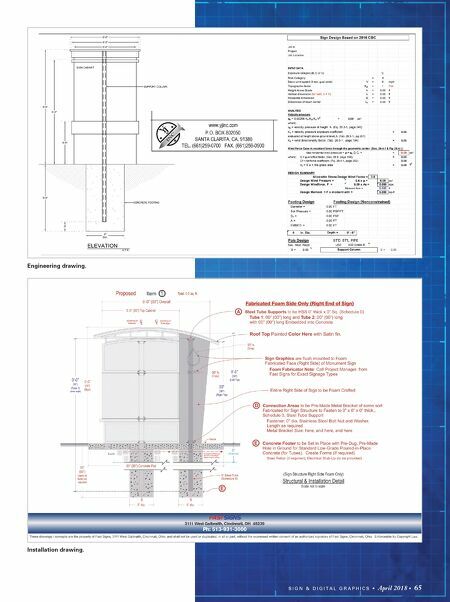 Why does it take so long to get a drawing that has clear and complete specifications so that an estimator can create a quote? Why does it take so long to create a paradigm sign submittal for a city? Here are some reasons a designer may not be able to draw fast: • Not knowing how to create a full sign submittal for a municipality (a standard template). • Not knowing how to write concise but detailed sign speci- fications (for quoting). • Not knowing how to do shop drawings (technical, design- to-build drawings). • Not knowing how to draw a clear, easy-to-read, section detail for a building sign with electric power. • Not knowing how to draw a clear, easy-to-read, ground sign installation drawing with electric power. • Not knowing how to do speculation drawings (with options). • Not knowing how to create a day and night version of a sign (with options). • Not knowing how to create a 3 D view that is a realistic, dimensional rendering with a sign (with an isometric graphic). Doing sign design and drawing layouts every day is so exten- sive, an owner and sales person should be well aware that profes- sional sign design is very difficult. But also, a designer who does not have a proper knowledge of each sign type, lacks dimensional knowledge. A designer who is not constantly increasing their speed is a good reason why drawings take so long. Sign submittal drawings.